It’s the week of Valentine’s Day, and A.J.’s class is getting a foreign exchange student! His name is Pierre, and he’s from France. But what happens when Pierre challenges A.J. to a duel (or at least a thumb war) over Andrea? One thing’s for sure: when L-O-V-E comes to Ella Mentry, it spells the weirdest Valentine’s Day story in the history of the world! This fun book is for readers in grades 1-3 and is selling for only 99 cents today. 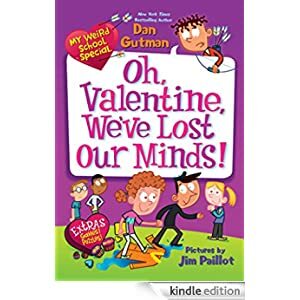 Click here to purchase My Weird School Special: Oh, Valentine, We’ve Lost Our Minds!